Home » Featured » News & Updates » Thanks for Spring Breaking With Us! Spring Break 2016 seems like a distant memory now, but for one month in March, Panama City Beach was still the place to be. EDM superstar Steve Aoki performed at the Beach Bash Music Fest to a massive crowd for the second time in three years. Country star Brett Eldredge also headlined on day two, filling the void left by Luke Bryan’s absence. 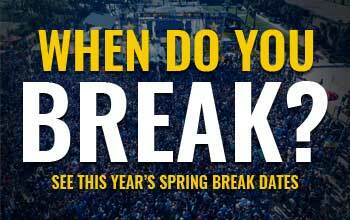 These performers did not disappoint, playing some of the hottest and most popular music to spring break’s largest crowds. Of course, one of the main reasons why we all come here and why people keep coming back is our amazing beach. The emerald coastline is world renowned and really is a spectacular place to be. Nothing beats our amazing hotels, nightlife scene, restaurants, and daytime attractions. We hope you’ll join us in 2017 when we do it all again.